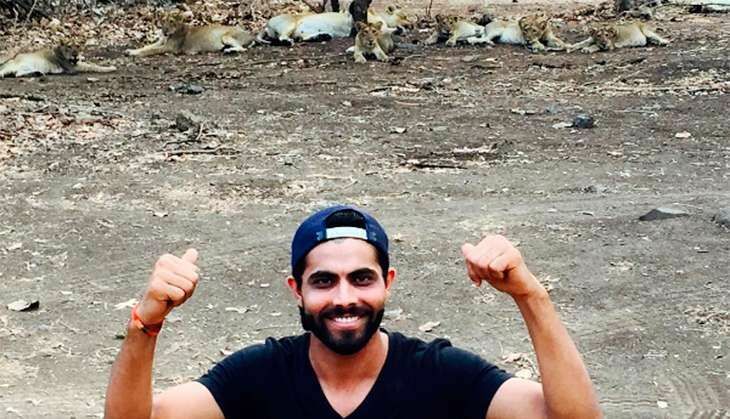 Indian cricketer Ravindra Jadeja was let off by Gujarat forest department after he paid a fine of Rs 20,000 for a taking selfie with lions at Gir Wildlife Sanctuary at Sasan in Junagadh, an act strictly prohibited by law. Since Jadeja is out of the country, his father-in-law Hardevsinh Solanki, a resident of Rajkot, gave the statement on behalf of Jadeja and paid the fine recently, Chief Conservator of Forests (CCF), Junagadh, AP Singh said. The inquiry report is yet to be sent to authorities. "We have collected Rs 20,000 fine from Jadeja for flouting rules inside the sanctuary during his visit in June. Since he was not available, we have taken statement from his father-in-law, who also paid the fine on Jadeja's behalf," Singh said, adding that the inquiry report is yet to be sent to authorities. On June 17, Singh ordered an inquiry after some of the photos, where Jadeja along with his wife Reeva were seen standing on the ground and posing in-front of lions, went viral on social media platforms. Lion safari is one of the main attractions at Sasan, where the forest department provides open-hood jeeps to tourists to watch lions inside the sanctuary. However, the tourists are prohibited from alighting the vehicle during the safari. In one of the photos, Jadeja and Reeva were seen sitting on the ground and a lion resting under a tree behind. In another photo, the cricketer was seen pointing at lions. In some of the photographs, the forest staff was also seen standing with the couple near their vehicles. "Penalty and inquiry report are two different things. The inquiry report will be sent to higher authorities after we finalise it. Action against the forest staff would be taken based on the findings of the report," Singh added.